We will be providing real-time updates tonight as the eviction orders for Philly and Occupy LA are carried out. You can view the Occupy Philadelphia live stream below, and read our real-time news updates directly under the video feed. Philadelphia, Pennsylvania was the first capital of the union. Mayor Nutter gave Occupy Philly a 5 o’clock deadline tonight as of 9 o’clock the occupiers are still occupying. There have been twitter reports of DHS on the scene and at 7:57 PM the General Assembly passed out quarters for from-jail phone calls. Activists from all over the country are taking buses to Philadelphia to join our brothers and sisters. In the background the sound of bells and sirens accentuate the voices of people’s mic. All the people statements begin with: ‘I want to live in a world that…’ Philadelphia police are saying that there will be no eviction tonight but activists are wary. Most of the national sweeps on Occupies across the country have come early in the mornings. That being said, Philadelphia police officers seem calm and supportive. We will be watching. The contraversey with the unions in Philadelphia comes because the city has a $50 million dollar project scheduled in the area that is being occupied (meaning jobs). As a resident of Philadelphia before I moved to New York I can say I witnessed libraries and public programs diminish to nothing in the last couple of years. This plaza is a corporate band aid on a public gash that needs reconstructive surgery. UPDATE: Russell Simmons has asked Mayor Nutter: “to remember this is a non-violent movement – please show restraint tonight.” Nutter has responded via twitter that he agrees. The crowd is starting to thinkbut the mood is optimistic and victorious (12:26AM). 12:27AM Philly Weekly Twitter is posting that… “a police presence seems to be building, so #OccupyPhilly is now locking arms” http://twitpic.com/7kz00r @Baslabbers is tweeting a similar message that seems to suggest police are moving in. 12:56AM: There has been more chatter on police buildup behind City Hall (Josh Kinney @theJKinz reports). But there is no sign thus far of anyone moving in. I propose that we rename city halls nationwide sitting halls. There are no helicopters as of yet. 1:11AM: Activist-overnighters on the ground are reporting that there are only 6 police officers left. Yet, there are conflicting reports on twitter of buildup out of sight. There are reportedly 300-400 people still at Philly Occupies. 1:32AM: There have been reports of garbage trucks showing up. Some occupiers are seeing this as a sign of inevitable eviction. 1:43AM: Police have demanded that the Occupy Philly drum-circle cease and desist. Activists have refused. More reports of garbage trucks arriving have surfaced. 2:00Am Occupier have taken to the streets and began to march. There is no other sign of police crackdown. 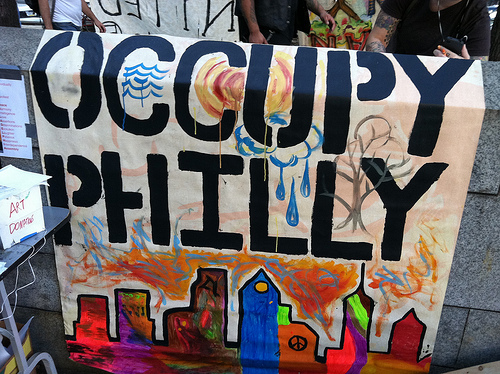 6:00AM: Occupy Philly has now lasted 13hours without incident past Mayor Nutters eviction timeline. It is rumored that police are waiting for Mayor Nutter to return to Philadelphia on Tuesday to raid Occupy Philly.